While the Sierra sun bleaches the old bones of Yosemite, I sit on a large granite slab, overlooking an emerald pool of the Merced River. The sheeted rock is formed like a staircase with small waterfalls leading to pools; the pools lead to another cascade, and so on, until the valley floor is reached. There the river courses more gently toward Merced Lake. Its a perfect early-autumn day to whittle away the time in Californias high country. My respite comes after an active morning of fly-fishing for rainbow and brook trout. My friend, Rick Ponte, and I are taking a week to explore Yosemite on horseback. Our September journey will lead from Tuolumne Meadows to Glacier Point, overlooking Yosemite Valley. We have selected late September because of the traditional good weather and a paucity of people in the backcountry. We will encounter few backpackers and no horse packers except for park ranger and painter Holly Nash, a self described "park brat," as she packs out of her summer encampment at Washburn Lake. "Impossible for a Man to Descend"
Cliffs at Yosemite National Park Wherever one travels in Yosemite National Park, one marvels at the dynamic, potent scenery  the culmination and continuance of millions of years of volcanism and erosion. Nothing in Yosemite suggests quiescence, passiveness or restraint. This is a grand land of immense rock formations, mighty mountain peaks, deep canyons, topaz and emerald lakes, charging waterways and wondrous waterfalls. Of the worlds ten highest free-falling waterfalls, two are in Yosemite, Yosemite Falls, 2,425 ft. and Sentinel Falls, 2,000 ft. Early photographers and the eloquent writings of naturalist John Muir paved the way toward preservation of this land as Yosemite National Park, established in 1890.
impossible for a man to descend." They had not even considered that men would one day both descend and ascend the 4,000-vertical-feet cliffs. My companion Rick had witnessed one of the most historic ascents from the valley floor over thirty years earlier. He was the first to greet Warren Harding and Dean Caldwell on their 28-day-long, first ascent of Yosemite Valleys El Capitan. 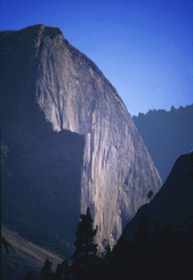 "When I peered over El Capitans Wall of the Morning Light, there was Harding, an outreached hand away," remembers Ponte. Ponte had led journalists from around the world to the spot where the two climbers ascended into legend. Today, climbers from all over the world have made Yosemites granite monoliths into a beehive of activity. Ponte would be my guide and mentor during this Yosemite trip, his first return to the Park since l973. "I worked for the Curry Companys High Sierra Camp and Tuolumne Stables [which he headed] for 14 years," reminisces Ponte. It is here where he would meet his future wife Carol, daughter of Gino Ottonello, Yosemites Federal Magistrate for 30 years. An expert horseman and horse packer, Ponte on several occasions packed in legendary photographer Ansel Adams. Adams large black and white images have illuminated the natural beauty of Yosemite better than those of any other photographer. "Ansel loved life. He was very friendly and loved by all who knew him," remembers Ponte fondly. 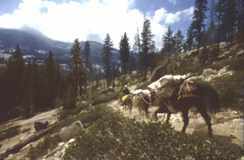 Day horseback trips and extended horse pack traveling is commonplace in Yosemite. 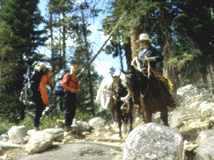 Early park explorations, ongoing trail building, visits by honoraries such as Presidents Teddy Roosevelt and Ronald Reagan, and supply stocking throughout the parks camps have all been conducted on horseback. "Ninety percent of the trails are on rock," says Ponte, "therefore, horses do little damage to the trails." Rick and I travel with four surefooted standard bred horses  two for riding, two for packing. Though we brought our own horses, horses can be rented (with or without guides) at Tuolumne Stables or Yosemite Valley Stables. Each packhorse carries up to 200 pounds, evenly distributed on each side. The horses allow us to carry fishing gear, photo equipment, and plenty of fresh food, including two bottles of vintage wine. Leaving Tuolumne Meadows, we quickly gain elevation, riding through Cathedral Pass, beside stoic, chiseled Cathedral Peak (10,940 ft.) and along the edges of Cathedral Lake. A few miles past Sunrise Backcountry Campground we set up our first encampment along isolated Echo Creek. 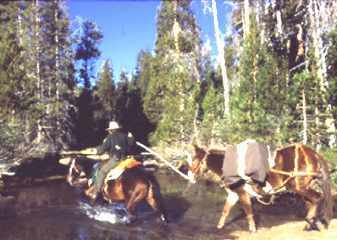 After caring for the horses, we slip into the refreshing glacier-polished pools to cleanse off the trail dust. The Eastern Brook Trout are biting well, so we easily catch enough to supply our needs for supper and breakfast. Our Merced Lake encampment the following day brings us to the trips lowest elevation (7,250 ft., altitude). We stay several days, enjoying the warm weather, the scenery, day explorations, swimming, fishing, photography and camp reading. Other than a few backpackers, we have the area to ourselves. Tarrying the days away pleasantly trapped in the might, sheer beauty and poetry of Merced Canyon will never be forgotten. Granite, gin clear water, pine, fir and regal cedar rule this zone. 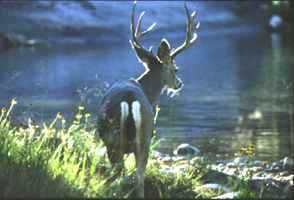 Each morning, in dawns first light, we are treated to the sight of several three-point mule deer bucks drinking from the river. Continually, we sight Stellers jays, sapsucker woodpeckers, belted kingfishers, Oregon juncos, soaring hawks, and the comic, constantly bobbing water ouzel birds. 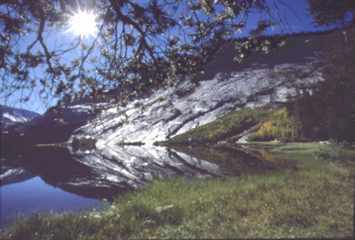 Yosemite is home to 75 mammals species, 240 bird species, and over 1,500 different types of plants. One notable Yosemite tree is the giant sequoia, known to live 3,200 years. John Muir reported one at 4,000 years in age. Our last encampment is in a grove of large fir, pine, and cedar along idyllic Sunrise Creek. Near our camp, we have a compelling view of Half Domes bare, solid rock face. I trek several miles on foot from our camp one afternoon and climb Half Domes back side. Its no sooner that I have left our isolated camp and hiked a mile, that I run into a human traffic jam on the main trail to Half Dome. Rick had warned, "Youll be in shock when you hit the main trail. Some days, as many as 600 come from the Valley floor to tackle Half Dome." 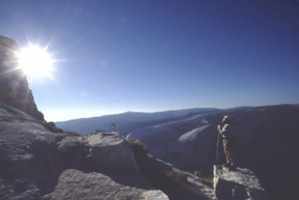 Without climbing gear, a hail and hearty trekker can reach Half Domes summit via a cable climb, at times ascending nearly straight up the formidable granite. It is well worth the efforts to attain Half Domes summit views: the spectacular Clark Range, Dana Peak (13,053 ft.), Mt. Lyell (13,114 ft.), Red Peak Pass, Star King, Clouds Rest, Tenaya Peak, Little Yosemite, Royal Arches, Yosemite Valley, North Dome, Muir Lake, Tenaya Canyon and Glacier Point. In the last light of day I trek back to our camp, my heart in my throat, my soul soaring, the last to leave Half Domes magnificent summit. Later that night, we encounter our first Yosemite black bear of the trip as he raids our camp. A constant vigil of yelling and tossing of small stones keep him at bay the remainder of the evening. Rick says, "He made a mortal enemy of me when he ate my fig Newtons!" Bear-proof food containers are added to our future Yosemite pack list. Our journey ends at Glacier Point, offering astounding vistas in every direction, including 3,200 feet below to the Valleys floor. Glacier Point offers the most sweeping views of the Park that are accessible by auto. En route that day, we pass Nevada and Vernal Falls. The two cascades and the Glacier Point views provide the perfect ending for our horse-packing week in majestic Yosemite National Park. Click here for details to plan your own trip to Yosemite National Park.